Sigma Acoustics Ouverture loudspeakers. What a look! I don't know about you, but I like individuality - that doesn't necessarily mean unicity. When it doesn't turn into extravagance-or-die, but it's wisely and smartly supported by aesthetic culture and a teaspoon of style, then it transmits a light pleasure and a rewarding admiration for the people who could actually realise a concept that, in the end, can evoke positive sensations beyond the real purpose for which the object was made. A complicated concept? Then, I'll make it simpler. I found these Ouverture loudspeakers by sigma Acoustic very pleasant not only to listen to, but also to look at. Produced and distributed (in Italy) by Extreme Audio - a very Italianate firm already famous at TNT, since it also distributes the White Gold Electronics brand, producer of the excellent (and, unfortunately, very expensive) cabling systems previously reviewed in these very pages. Aesthetically, the Ouvertures get it absolutely right. 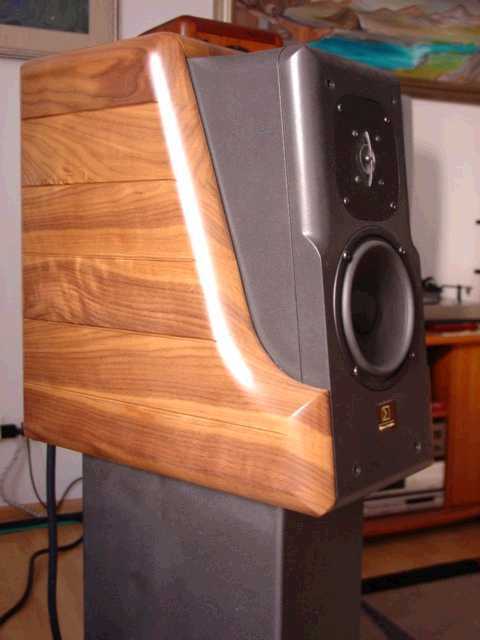 They are made of MDF and walnut hardwood sections - something rather common in today's loudspeaker production. However, thanks to their distinctive and singularly fluid lines, plus their dimensions, rather large for a bookshelf (their depth is noteworthy), these loudspeakers can exude a real feeling of uniqueness and exclusivity. I learned from their producer that Ouvertures' masterfully assembled enclosure is the handiwork of a renowned cabinetmaker from Vicenza, who built Sonus Faber's first models. Obviously, aesthetic research is not independent of functional purposes, and the whole cabinet shape was studied to optimize the drivers' spatial response. Technically speaking, what we have here is a two-way stand-mounted loudspeaker, with a rear firing tuned port - to avoid direct emission of spuriae in the mid-low range. Even so, those spuriae, although rear-emitted, could still be harmful in particularly reverberant rooms. The producer's solution to this potential problem is that - thanks also to the experience had with its top-range omni-directional loudspeaker - a mechanical acoustic screen is provided, that, when needed, can be easily placed near the tuning port, to optimize the in-room behaviour, improving the system's characteristics of precision and focus. The woofer used is a Morel, with an hybrid ferrite/neodymium magnet. It is a shielded driver; its particularly light membrane is made of a mixture of polypropylene and injected paper. The tweeter used is an inverted-dome, Toxid membrane Focal TC120. Both drivers are controlled by a 6 db/octave crossover network, tuned at approximately 1900 Hz. The filter sports Ayrton-Perry non-inductive resistors, air-wounded coils and polyester capacitors. Internal wiring is, needless to say, White Gold Electronics cable, expressly conceived according to the frequencies it is intended to transfer to each driver. Should you want them, specifically designed stands are available. 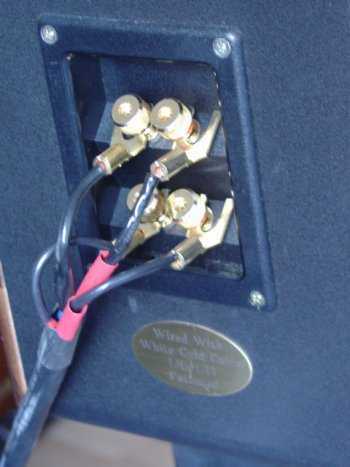 An ideal complement, both aesthetically and functionally, to the Ouvertures, they are rather solid and large, and I wouldn't have been surprised if the designer had thought of using them with the tuning port mounted in the base (rather than in the rear panel of the speakers) thus benefiting from the extra acoustic load to improve the speakers' response in the low range. 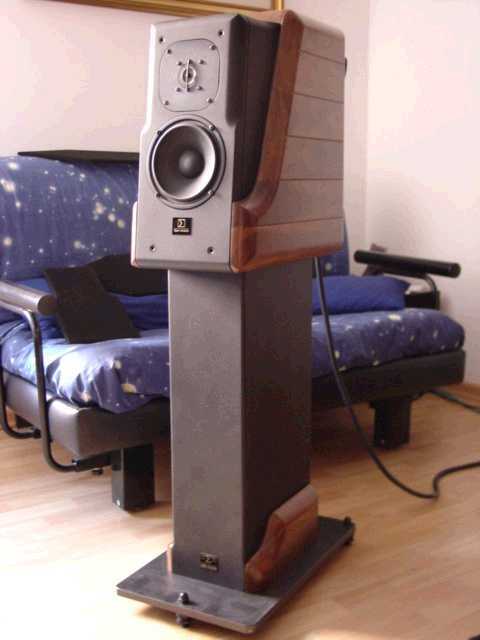 Besides this model, the firm's range presents two more loudspeaker models, both floor-standing, substantially different for components used and the financial commitment: the Image, a rather traditional two-way loudspeaker, and the much more complex and significant T-815, a six-way model, with omni-directional emission, also featuring an external X-Over. Far removed from aggressiveness and violent protagonism, the Ouvertures prefer an harmonious encounter, in peaceful, warm and cosy surroundings, with a captivating and intimate atmosphere. Comfortably seated on your favourite couch, immersed in the familiarity your room, surrounded by the objects that discretely call to mind the most significant moments in your life, you will find the ideal circumstances to extract form these loudspeakers' presentation all the emotions that your favourite music can evoke. Cast off your hustle, and be sure Ouvertures won't bustle you. No, they will do their best to relax you, with their supple and warm voice. Yet, without misrepresentation; rather, seeking to tell you the truth, with plenty of details, but without impolite and inelegant excess. Smooth and unexpectedly extended toward the bass - where they can give a good account of instruments that present extension and immanence amongst their highlights - they refuse to be imprecise in the mid-low range that is rendered in an articulate, although not in a super-fast and nervous, way. This is an aspect that more than marginally contributes to determine Ouverture's described character. The midrange, warm and mellow, is decidedly coherent with the lower range, and the musical message uninterruptedly flows toward the mid-high range, which - due to its calm, refined and balanced characteristics - can occasionally seem euphonic with some types of music. Yet, I wouldn't want it differently, because it could run the risk of disrupting the nature of a decidedly well-executed project. The top-high range of the audible band is also calm and controlled, and can render the mandatory level of detail with precision and good air. Although not particularly demanding, due to their balanced timbric structure, the Ouvertures are rather sensitive to the quality of associated equipment. Thanks also to their good extension into the low range; they can express a significant sense of realism, provided they are firmly and authoritatively driven. An energetic and well contrasted amplifier, boasting – to use a motoristic paraphrase - a good "torque" even at low levels, with a liquid yet vivid and lustrous sound, in my opinion is the ideal partner for these Sigma Acoustics babies. What I'm trying to say, is that with stand-mounted loudspeakers it's unusual to meet such completeness - often low frequency performance and power-handling tend to be somehow sacrificed. So, it makes sense to endeavour to optimise the positive aspects of this loudspeaker, making the most of its pros and accepting its limits. In this particular case, it was decided to aim at a complete output (but obviously, don't expect "20 Hz flat..."), and this developmental effort must not be devalued, but rather underlined. Analyzing this loudspeaker's timbral characteristics makes it clear that the quest for micro-contrasts wasn't pursued by forcing the tweeter's expressivity, which is never aggressive or manic. However, the system's significant transparency never limits the rendering of those small impulsive events that materialise in your listening room in a clear and clean way, within a sweet and always very pleasant context. The woofer, on its own, is coherent with the tweeter's output. This coherence is retained also in the big dynamic contrasts that the Ouvertures can follow with completeness, adequate velocity and an appreciable sense of realism. Be sure that, while not being big boxes, they won't limit your amplification's dynamic abilities, but rather they will develop an unexpectedly big sound relative to their dimensions (actually, as already observed, their depth is significant...). In my case, their in-room placement wasn't the easiest of the things to accomplish. The Ouvertures revealed themselves to be very sensitive to room placement. Minimal movements turned into significant changes in timbre and in virtual image, particularly in terms of focus. In the end, the system was optimised by placing the loudspeakers rather far away from each other, with their axes of emission crossing exactly at the listening point, and also positioning the acoustical screen near the rear firing tuning ports. Under those conditions, the holography was rendered remarkably, with a particularly successful mixture of pastel colours and chromatic contrasts. This allowed me to appreciate the blend in the musical interpretation as well as single instruments that are not only very discernable individuality in the room but also nicely ensconced in their own harmonic aura. A wide and deep soundstage, populated with actors that never fail to involve you, with shivers and emotions. In particular, voices are really beautiful, as well as those solo instruments whose fundamentals are in the midrange zone. The Ouvertures are loudspeaker that we could jokingly define as "risky". At a reasonable price, they offer a very good musical performance that significantly improves with the quality of the preceding electronics. Simply good with good gear, they exhibit a very good sound with high level partners. I hooked them up to almost all the amplifiers that I at my disposition during the test period, and, - besides a kind of idiosyncrasy against the Pathos Logos - they sounded pretty good even with the little solid-state 35 W/chanel NLF Amp 02 integrated amplifier. They expressed themselves at high level with the North Star Linestage + Monoblock Amplifier system. Finally, they were sublime with the AM Audio A1 + A80 Reference S2 system. The "risk", so to say, is that you could find yourself deciding to spend much more money on your source and amplification. I don't usually make reflections concerning the selling price of the gear I review, but this time I can't help but consider how the amount of money required to own such little gems is all but disproportionate; with a quality/price ratio decidedly in favour of the buyer. The notable price difference to the next model up in the Sigma Acoustic catalogue (the Image), leads one to suspect that it is the result of a definite strategic and commercial choice to keep the final price level of the brand’s "entry level" model (Ouverture) as low as possible. The purpose is clear: to penetrate the crowded sector of circa-2,000 Euro loudspeakers. It's not an easy task – the competitors are numerous and fierce. But, as far as I heard, these Sigma Acoustic Ouvertures truly have all the quality to assert themselves!